As an up-and-coming innovator in the solar mounting space, Pegasus Solar made an impression at this year's Solar Power International conference. The company announced a supply deal with Sungevity, introduced a new rail-less mounting system for tile roofs, and even had to throw some competitors off its demo roof to prevent them from reverse-engineering the rail-free residential solar mounting solution on the spot. Eliminating rails for residential composite and tile roofs promises project savings on the unavoidable costs of rail mounting systems, including inventory, logistics, shipping and installation labor. According to the Pegasus Solar strategy, its LightSpeed Mounting systems are priced at or below traditional rail systems so installers can convert these project savings into lower total installed costs. Though part of a complete residential composite roof kit, the LightSpeed mounting system has two key innovative components: the mounting assembly and module corner hinges. Featuring a threaded leveling system, the mounting assembly is simply turned to adjust height or orientation and covers a flashing mounting base with a cone to ensure waterproofing. The mounting assemblies are attached to roof rafters and can span up to 6 feet under nominal low wind or snow weather conditions. 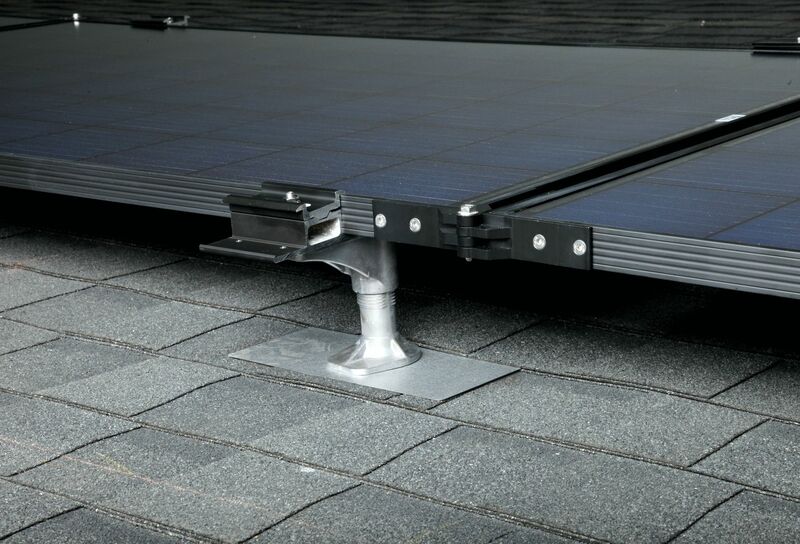 Each single mounting assembly has two clamps for PV modules on adjacent rows; PV modules can be installed in portrait, landscape, or mixed orientations as required by the roof characteristics. A typical 20- to 25-module array requires about 1.25 to 1.5 LightSpeed mounts per module, or some 25 percent fewer roof penetrations than standard rail systems. 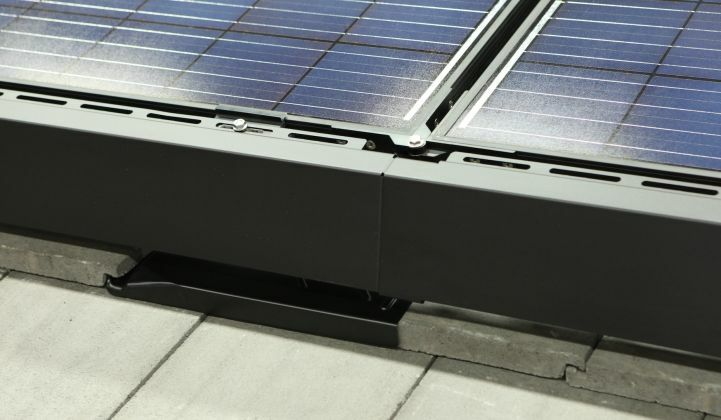 The corner hinges are factory-installed on framed PV modules, and bolts at each corner connect adjacent modules along the same independent row, adding mechanical strength and redundant bonding (grounding) with automatic alignment. PV module frames used as part of the mounting system are strong enough subject to AHJ (authority having jurisdiction) requirements except in extreme wind or snow environments. The mounting assemblies also provide redundant grounding between adjacent rows, and, combined with the corner hinges, create a mesh grounding scheme across the module array. After attaching a grounding lug to an open corner hinge, a grounding conductor can be routed from the lug to the junction box to complete the array grounding. So far, Pegasus has partnered with select major PV module manufacturers to pre-install corner hinges at the factory or pre=punch four holes at the corner of each frame for subsequent installation. Installing corner hinges does not require a custom PV module frame or recertification so ETL or UL listings are not impacted. The Pegasus Solar facility, located in Richmond, California, can also install corner hinges on PV modules to help PV manufacturers get started with LightSpeed support. Trina Solar will begin shipping LightSpeed ready PV modules with the hinges in January 2017 as a standard product. The LightSpeed mounting system can require more upfront planning for the layout design, and Pegasus has developed a software design tool in beta release with select customers to layout, optimize, and generate the bill of materials, drawings, and load calculations suitable for a permit application. Pegasus recommends beginning the module installation from the lower edge or eave of the roof toward the top ridge. Without rails, module-level power electronics (MLPE) will need to be attached to the module with a bracket. PV module cable clips also need to be pre-installed on the ground. Most installations have been moving in this direction anyway to reduce install times on the roof. Delving into the rail-free cost reductions, Pegasus has identified about $0.08 per watt in savings per average solar installation by avoiding the costs of rail mounting systems. Installation labor represents just over $0.04 per watt, or half of the savings. After field training on a few jobs by Pegasus Solar, LightSpeed customer teams have been benchmarked completing installations around 50 percent faster than rail-based installations. Depending on the customer’s business, labor savings are realized either by increasing residential project installs per day or reducing crew size per install. Pegasus Solar was founded by CEO Kai Stephan in 2012, who was intent on moving as much labor from the field to the factory as possible in order to reduce cost while increasing quality. “We took our time to develop a product the field would like," said Stephan. Though funding has not been disclosed, Pegasus Solar has been venture-backed by Okapi Venture Capital for three years, and the company’s board of advisors is packed with veteran technology and solar industry players and investors. As outlined in GTM by Glenn Harris, who serves on the company's board, Pegasus has developed the mounting solution mindful of existing rail-free intellectual property from Zep Solar, acquired by SolarCity, as well as IP from Westinghouse. Pegasus believes its mechanical patents are very strong. With over a dozen utility patents filed in the U.S. and various other countries, Pegasus has already been granted two patents and expects several more to be granted soon. Pegasus Solar has built a redundant supply chain, with about 500 to 600 megawatts of capacity in 2017 comparable to captive Zep capacity at SolarCity. With design for manufacturing, the LightSpeed components are die-cast, easy to make, and have low scrap rates. While some are manufactured in the United States, most are produced in Asia. “Significant shipments are beginning now," said Stephan, referring to the Sungevity deal. The LightSpeed system for tile roofs uses a tile replacement approach. Pegasus views the U.S. residential solar market as 60 percent composite and 40 percent tile roofs, with strong regional concentration -- composite roofs dominate the Northeast while tile roofs are prevalent in the Southwest, Colorado and Florida. Pegasus said it has designs and IP to support glass-glass and frameless modules, and expects to release an innovative solution for flat-roof applications in 2017. Rail-free competition is also heating up, as companies like Quick Mount PV and SMASHsolar develop new mounting solutions as well.